← ina’s mustard roasted potatoes. Since we were not exactly on the ball, in terms of getting some Thanksgiving recipes out to you in a timely manner, I figured I’d squeeze in a quick side dish in before the big day arrives! 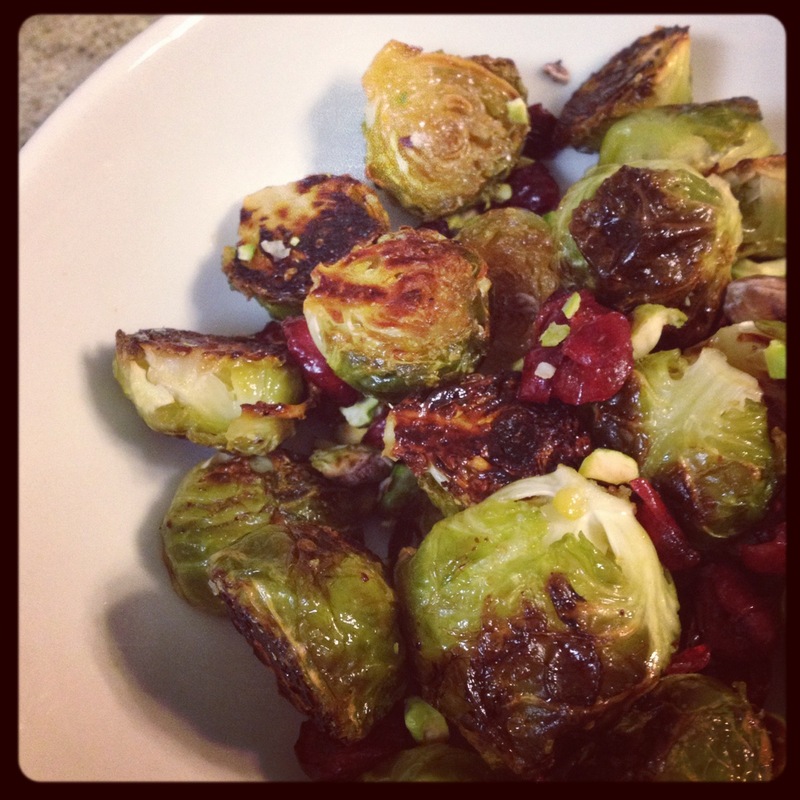 As I continue my quest to win the world over with brussel sprouts, I have another delicious variation for you to try. 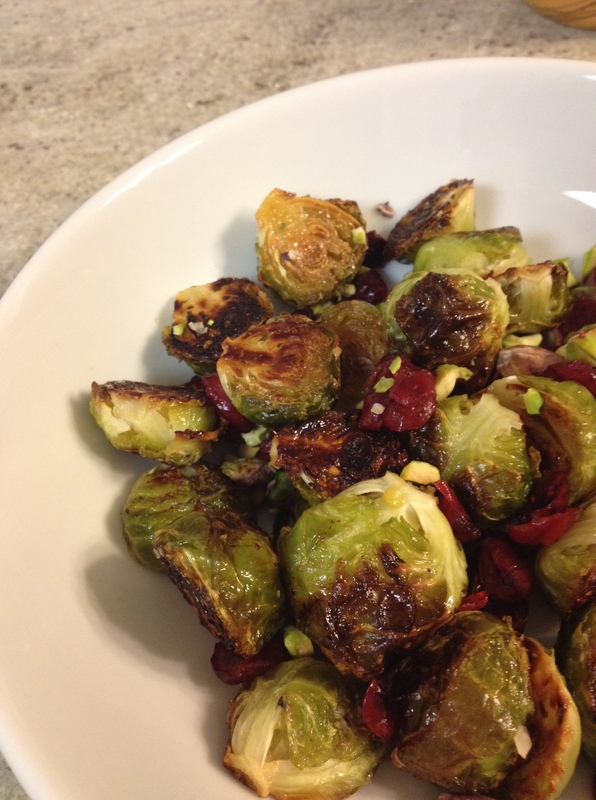 This incarnation adds has a bit of sweetness in the marinade, uses chopped pistachios to mirror the nuttiness of the sprouts themselves, and gets a tart kick from the dried cranberries. Oh, and it looks pretty, too! It requires about 5 minutes of prep, and 15-20 minutes of oven time; you can throw this dish into the oven while the turkey is resting, and it’ll be ready to serve just as you carve up the bird. *Side note: while I typically use dried cranberries and dried cherries interchangeably, I would not use dried cherries in this recipe; I think you need the tartness of the cranberries to offset the honey, so you don’t end up with an overly sweet side dish! 1.) Preheat the oven to 400°. Start by trimming and cleaning your brussel sprouts; cut the little stems off, and then remove any bruised or discolored outer leaves (usually the top layer or two needs to be removed). Slice the sprouts in half (or quarters, if you’ve got some monsters). 2.) In a mixing bowl, whisk together the honey, olive oil, garlic powder, and salt, until it’s well-combined. Add your sprouts, and use your hands to toss everything until all the brussel sprouts are evenly coated in the marinade. 3.) Line a rimmed baking sheet with foil (non-stick is ideal, here). Arrange the sprouts, cut side down, in a single layer. 5.) 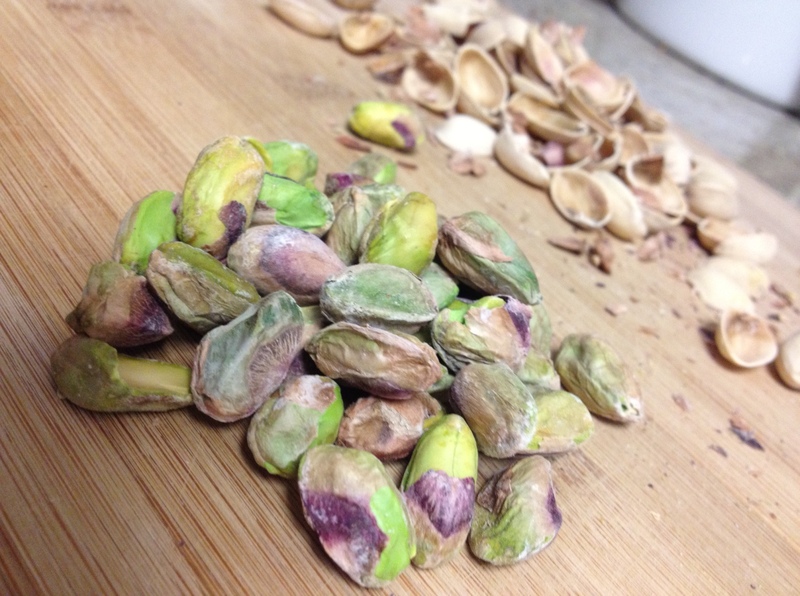 While the sprouts roast, shell and roughly chop your pistachios, You can chop the dried cranberries if you’d like, but it’s not necessary (mine were fairly small). 6.) When the sprouts are ready, pull the pan out of the oven, and throw the pistachios and cranberries on to the baking sheet. Use a spatula to mix everything together, and then pour everything into a serving bowl. Serve immediately! This might be my new favorite version of brussel sprouts. Plenty of flavor and texture, and quick and easy to make! Give these a try over the holiday weekend; I think you’ll manage to convert even the most avid sprouts-haters! i would disagree that brussels sprouts are better than turkey, and i don’t even like turkey. Awesome! I’m charged with a side dish this year and was planning to do the sprouts. I might just have to take a risk and do this version instead! I am biased, but I think they’d be a huge hit! If you’re nervous about them being a little too dressed up for some people, you could always roast two small pans of sprouts – one of this variety, and one that’s a little more plain. Good luck!! Ok, I made this bad boy again last night, but added carrots and beets too. While the roots needed a little longer than the sprouts, it was still super delish! Added some country sausage for extra protein, and will definitely be doing this again. Thanks again for the idea!